I got very interesting paper. N-Vinyl-2-pyrrolidone (VP) is known to be a hydrophilic monomer. Because of monomer’s hydrophilic characteristics, PVP is hydrophilic materials, which generally possess excellent biocompatibility with living tissues and extremely low cytotoxicity and used as bio-adhesives. In the paper, they made several co-polymers and check swelling properties with several solvents. 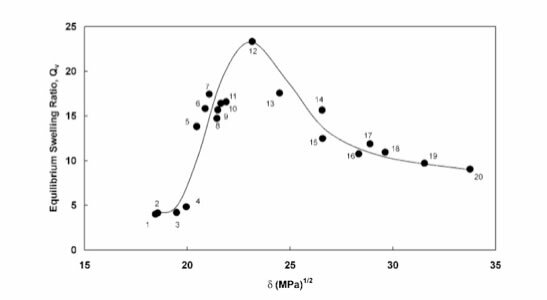 I show the original PVP swelling-Hildebrand SP value plot below. They made 4 co-polymer with Crotonic Acid. The percentage of Crotonic Acid is different, but the peak of swelling is same. I re-calculated this swelling properties with Hansen Solubility Parameters(HSP). At first, I need make table like below. The value is swelling ratios for each PVP polymer and co-polymers. If the ratio of Crotonic Acid increase, swelling percentage decrease. But it is very hard to understand this phenomena with Hildebrand SP because the top peaks of all the polymer are same. I applied Quantitative Sphere algorithm for this problem. Quantitative Sphere search the best HSP of solute that make largest correlation factor in HSPiP ver.3.1.X. For PVP-100% polymer, Q-Sphere determined the HSP as [17.4, 8.8, 14.9]. If the Crotonic Acid percentage increase, the co-polymer dP and dH increase. 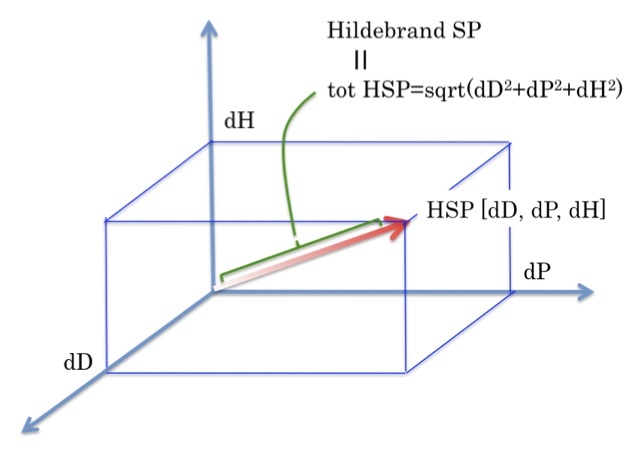 So, HSP result are quite different from Hildebrand result. The swelling percentage are decrease according to increase Crotonic Acid percentage. But the effect is not identical for solvents. For average HSP of blue zone solvents are [17.4, 7.3, 10.8]. And these solvents loose swelling power more quickly than red zone solvents [16.6, 9.8, 18.0]. This means Crotonic Acid make hydrogen bond network and larger dH solvents can cut this Hydrogen bonding network. I run classic Sphere program for CrA 13% co-polymer. The result is [17, 15.8,19.1] Radius=11.65. There are no wrong in/out. But radius is very large. I marked Red if the swelling larger than 7%. 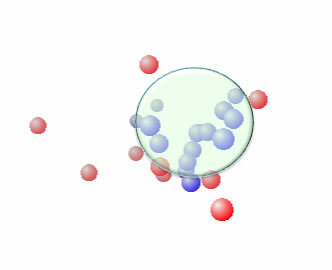 The more increasing Crotonic Acid, the less red Spheres. So, the hydrogen bonding of Crotonic Acid reduce dH value to something like anhydride.